Bow of EB Allen with diver below. Divers above bow windlass wrapped with anchor chain. Description: On its last voyage, the E.B. Allen was bound for Buffalo, New York, carrying a cargo of grain. When it was about 2 miles southeast of Thunder Bay Island, it met the bark Newsboy in heavy fog. The two ships collided, and the Newsboy tore a large hole in the Allen's portside. As the ship began to sink, the Allen's crew was removed and taken on board the other vessel. Today, the E.B. Allen sits on an even keel, with its hull largely intact. Although the masts are broken and most of the decking is gone, the windlass, anchor chains, and rudder are still in place. 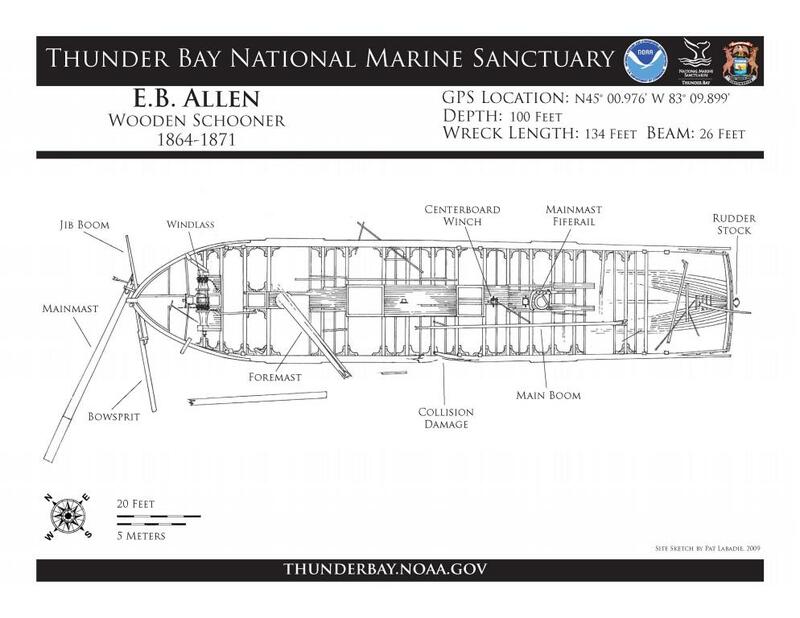 Enjoy diving the wrecks of Thunder Bay, but always respect the past. State and federal laws prohibit removing or disturbing artifacts. Future generations are depending on us to leave historic shipwrecks intact. Please take only pictures and leave only bubbles. The sanctuary maintains seasonal moorings at many shipwreck sites. Available from May to September, the moorings make for safer diving and also protect shipwrecks from anchor damage. Sanctuary regulations require vessels to use moorings when present.